Introduction: Media coverage is important to the effort towards fair recognition of women in sports. The media has strong influence on development of perceptions and attitudes. Ensuring positive and regular appearance of women in diverse sport roles and positions in the public printed media can contribute to improving the public view of women in sport. 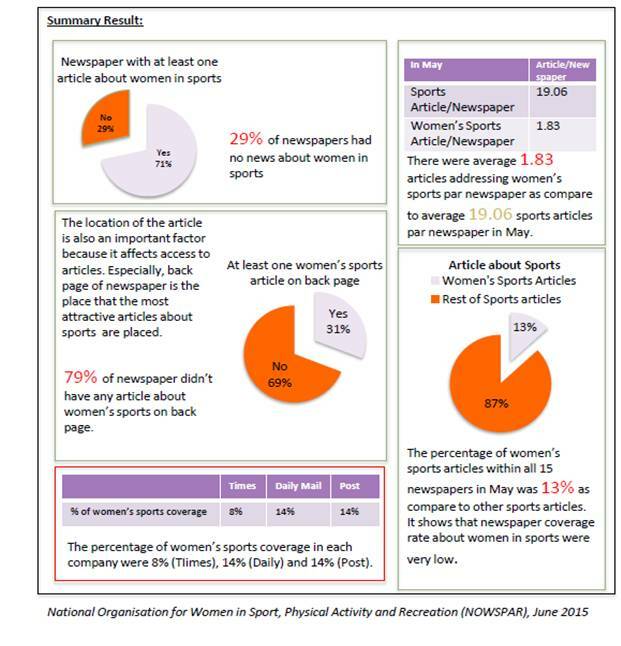 NOWSPAR has conducted this survey to get a quick view of the current newspaper coverage rate of women in sports. Method: Over a period of 13 days in April and May, 2015, we randomly selected 42 editions of newspapers from three different publications; Times of Zambia, Daily Mail and The Post. The only condition of these 13 days was to have topics related to women in sports on that days. 8 days were selected in April and 5 days in May. This edition of the Survey was conducted by Ms. Aya Noguchi, the Survey is part of NOWSPAR’s advocacy and communication work within the Every Body Matters Programme supported by the Norwegian Olympic and Paralympic Committee and Confederation of Sport.